With a shortage looming, a group of Texas court reporters has taken the unusual step of raising money to educate the next generation of court reporters. There is a very critical nationwide shortage of court reporters affecting the legal system, and many in the industry are coming together to employ creative solutions to solve this looming crisis. Project Steno is designed to help promising new reporting students, recruited through a free introduction to court reporting known as the Steno A to Z Program, with their court reporting school tuition. TEXDRA recently concluded its first successful Steno A to Z class, and there are several more classes happening statewide; the program is also now featured online. 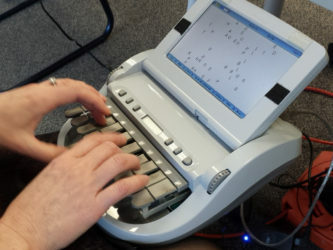 The initial first step in Project Steno’s 4-step plan is to engage prospective court reporting students in one of many A to Z programs being delivered by volunteer court reporters across the U.S. Students who graduate from an A to Z program and are then accepted by Project Steno will be offered tuition assistance when they choose to attend a Project Steno Partner Program. TEXDRA is very proud to be engaged in this complementary, innovative and unprecedented effort. While there is the possibility of shortages of court reporters, in many ways, there’s never been a better time to be part of the business, thanks to advances in technology, solid salaries, and increasing demand.